On first listen, I can already picture Stencil. They’re likely a bunch of dudes, each with progressively longer beards. A couple are wearing beanies, and the rest are wearing button up shirts, with the sleeves slightly rolled up — once over, to be exact. One might be wearing torn jeans, and one might still be wearing his jacket despite the warmth of the club. All of the shoes are pretty non-descript, and you won’t see a single necklace, bracelet, earring, nose ring, bling, or accessory on board. In other words, Stencil is the mythical brand of woodsy folk people that populate the greater Pacific Northwest — the Seattle area, most specifically. 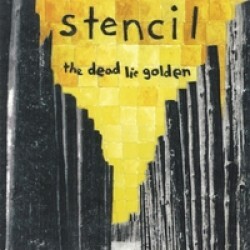 The Dead Lie Golden is the debut from this orchestra-driven pop band. Lead singer Jared Fiechtner echoes an eerily similar Michael Stipe tone over some pretty lush orchestral pieces that progress, generally as most orchestra pieces do, at a snail’s pace. For what it is, it really isn’t that bad. But it becomes readily apparent from the beginning that this band is bigger than what Stencil really is. Most tracks are layered with the cello and violin with a pleasing result. But then Stencil tries to do a bit too much, and tracks like “Vignettes” suddenly have a bit of piano/synth on top, and the track just isn’t grand enough to haul in the three grand sounds of each classical instrument. It is a nice attempt, but using orchestral instruments is just like making arena rock. To succeed, you have to fill a lot of space with a lot of sound. Stencil’s sound is generally more appropriate for a room full of a couple hundred people standing and nodding along with a tallboy of PBR in hand. The piano eventually becomes out of place and the trumpets a bit odd, leaving Fiechtner’s voice, which, although pleasant, isn’t strong enough to be able to carry the sound alone. Like Fleet Foxes discovered quite successfully last year, vocal melodies can go a long way, but Stencil hasn’t successfully made the leap just yet. The instrumental melodies are nice as well, but just aren’t enough to keep it all going. The Dead Lie Golden is a good shot at something that as of now, is just a bit too out of reach to work.